Chord inversions are a great way to mix up your playing and give you an opportunity to use what you’ve already learned but in a slightly different way. If you’ve already got a handful of chords memorised and can change comfortably between them within the flow of a song then chord inversions could be just what the doctor ordered. Sounds great, but what are chord inversions? Well the good news is that it sounds more complex than it actually is. Chord inversions are simply alternative ways to play the same chords. Take a C chord for example, probably the first chord that you learned on ukulele. Do you know how to play it another way? 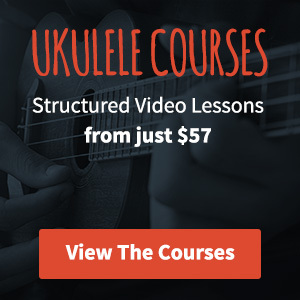 There are multiple ways to play each chord on a ukulele and this can be a very useful thing. Why do I need to play the same chord in a different way? There are quite a few reasons to get to grips with chord inversions. Firstly, how about proximity? We don’t always want to be playing right at the nut. If you’re playing a melody up at the 9th fret and need to follow it with a chord it might make more sense to stay closer rather than jumping back down to the nut. Another reason is fret hand muting. By taking an open chord and shifting it up the neck you’re suddenly in a position to be able to easily mute your chord by releasing pressure. If you’ve ever tried playing a funk rhythm with open chords you’ll know how important this can be. Chord inversions are really useful when you’re playing alongside someone else. If you’re playing the same chords at the same position as someone else then you’ll get a much more interesting sound if one of you plays the same chords in a different position. You’ll build a better texture. Notice that the F and G use the same chord shape – the F is barred at fret 5 and the G barred at fret 7. If you need some help playing these, check out my tips on playing barre chords here. Hopefully they’ll give you enough to get started with a few songs that you already know. Notice how it makes you’re playing a little different? When I’m playing my style changes quite a bit depending on where I’m playing on the neck. It’s also something that I take into account depending on the feel of the song that I’m going for. Great ideas, l will put them to practice , on Claw hammering , as l play some Banjo , its so easy once you know but it takes heaps of practice to get the muscle memory and l’m sure that is what it is . Is there a formula for coming up with the chord inversions? I don’t understand how you arrived at the chord formations above.